Replace a failed dead laptop hard disk drive - PC Buyer Beware! Dead laptop: My Toshiba Equium M70-173 laptop PC now uses Windows 7 Home Premium, which ran very nicely. It was working very well for several years running Windows XP and then Windows Vista. However, yesterday it could only display the screen that appears when Windows starts up. I switched it off, but it showed a message in white text on a black screen that said that it had suffered a hardware failure. I also heard a grinding noise coming from where its hard disk drive is, which, I assume, has died. Now the laptop won’t start up at all. I opened the panel that encloses the drive and found out what the make/model is: an Hitachi Travelstar HTS541060G9SA00. ls it possible to buy another hard disk drive for this laptop, and, if so, from where? I have the Recovery CD that came with the computer and I also have a retail copy Windows 7 Home Premium (the Upgrade version that was used to upgrade Windows Vista). I’m pretty sure that I can change the hard disk drive, but how do I reinstall Windows 7 to the new drive? No doubt the hard drive of your dead laptop has failed irretrievably. The drive on that make/model is an SATA model, which is now the interface standard in use by laptops. I used the model identification to look it up on the web. 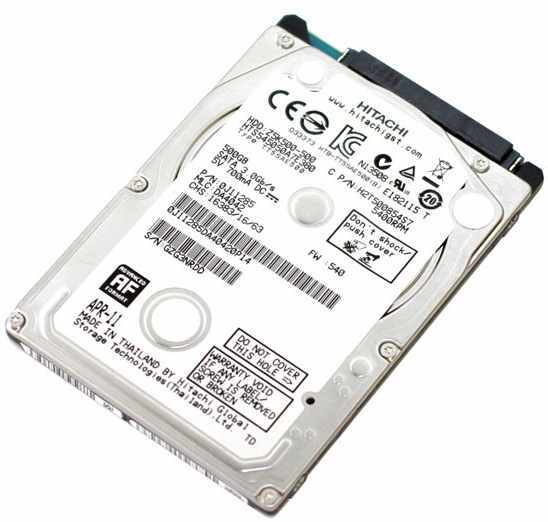 Amazon provided this description: Hitachi Travelstar 5K100 HTS541060G9SA00 60 GB 2.5 Internal Hard Drive – SATA/150 – 5400 rpm – 8 MB Buffer. It is a low-capacity drive (60GB) that is still available from the US site for $25 (February 2017). Fortunately, you can replace it with a much larger-capacity, faster, cheap, 2.5-inch drive. Note that the newer wholly electronic SSD drives also use the SATA interface. They are still significantly more expensive and much faster than hard drives. Nevertheless, increasingly, laptops are using SSDs instead of hard drives. Your dead laptop, being quite old, could have had an IDE (also known as PATA) hard drive, which would mean that you would have to replace the failed drive with a new or second-hand IDE drive, which are still available. You cannot replace an IDE drive with an SATA drive, because the cables and connectors of the two types of drive are different. I have just had a look at amazon.co.uk. Cheap 2.5-inch IDE laptop hard drives are still available (February 2017) for around £20. IDE laptop drives don’t seem to come in capacities higher than 80GB. I saw a nice one called: Hitachi 80GB 80 GB 2.5 Inch IDE (80GB 2.5″ PATA) Laptop Hard Drive 5400 RPM for £22. To avoid winding up with a dead laptop, I upgraded the SATA hard drive of a laptop of mine dating back to 2007. It came with a 100GB drive and I got a new 500GB Hitachi drive for £30 a few years ago. That laptop is still going strong using Windows 7. You can buy a replacement SATA laptop hard drive from any online computer component retailer. It is February 2017. I have just had a look on amazon.co.uk. Your dead drive has a low capacity of 60GB. There were several new 2.5-inch SATA Seagate, Western Digital and Toshiba drives ranging in price from £26 to £50, most of them with a capacity of 500GB. There is a Seagate 1TB (1000GB) Laptop SSHD – SATA 6GB/s 2.5-inch internal Solid State Hybrid drive, which is a hybrid hard drive and SSD for £100. 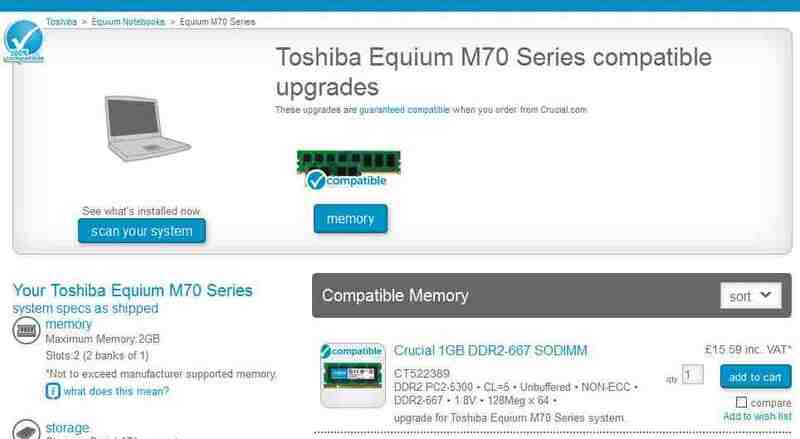 You must avoid buying it because, according to crucial.com, the RAM memory and SSD manufacturer, your laptop cannot be upgraded to an SSD. Note that it is not possible to upgrade some laptops that use an SATA hard drive to an SSD. I used the SSD Advisor Tool on crucial.com to find an SSD upgrade for your Toshiba Equium M70-173. Unfortunately, only RAM memory upgrades are available, which means that your laptop cannot run an SSD. That is unfortunate, because if the 60GB hard drive was sufficient for your needs, you could have upgraded to a much faster SSD with a capacity of 120GB for around £40 at current prices. Then again, your laptop is old and might pack in itself forever some time soon. See the image, below, of the result of the search. You should have an external USB hard disk drive with a capacity of 500GB or more on which to store backup system images. If not, invest in one. They are not expensive. Then, all you have to do is restore the most recent system image you have to the new hard disk drive to be up and running again. Since your hard drive is dead, if you don’t have a backup or system image to restore, you’ll have to reinstall Windows 7 using your installation disc. You could use a data-recovery company to recover your data to a new drive, but that would be hugely expensive. If you have another computer, you could download the latest Win7, which is up-to-date, and create an installation DVD or USB flash drive. You just need your Win7 Product Key. To install the new drive, with the computer switched off and its battery removed, remove the old drive from its bay and place the new drive in exactly the same orientation. It should just clip into the bay. Never force anything. The new drive should clip in easily if it is the right way up. You should always remove the battery to avoid electrical complications. The drive removal process varies from laptop to laptop. The drive might be enclosed in a caddy or it might be a bare drive that just fits into its socket in the drive bay. Toshiba laptop hard drives tend to come enclosed in a protective caddy. When the old drive is out of the bay, you remove the caddy and put it on the new drive. The video below shows the full process. The laptop should boot from a CD/DVD disc by default, so all you need to do is insert the Windows 7 disc into the optical drive and start the computer. If it doesn’t boot from the disc, you’ll need to switch the laptop off, remove the disc, restart it and then enter the BIOS setup program by pressing the F1 key at the first startup screen. The key you press can vary, but that is the key you press for this particular laptop. Note that your old laptop uses a standard legacy BIOS, not the newer UEFI BIOS. The BIOS settings display in several pages that have tabs. You need to find the settings for the boot order of devices that sets the priority of the boot devices, such as the CD/DVD drive, hard drive, USB flash drive, etc. The boot order settings are usually in the “Advanced BIOS Features” section of the system BIOS. You have to set CD/DVD drive as the first boot device instead of the hard drive. Make the hard drive the second boot device. If there is no CD/DVD disc in the optical drive then the computer will try to boot from the hard drive, which won’t happen in your case because the new hard drive is empty. The Recovery CD recovers the system to the state it was in when it left the factory – running Windows XP. You need to clean install Windows 7 because you cannot perform an in-place upgrade of XP to Win7. You can only upgrade from Windows Vista. Therefore, you need to clean install Win7. Installing a Win7 Upgrade version on a clean hard drive is not legal according to the terms of its licence. To do that requires the full version. Fortunately, it is possible to use the Upgrade version to install Win7 without having to install Windows Vista first and then use the Win7 disc to upgrade it. If you own a qualifying version of Windows (XP or Vista), you own the entitlement to use the Upgrade version of Windows 7. Here is an article that provides the information you require.There are many others you can find by using the page’s title. If you cannot get Win7 Upgrade to install, you’ll have to buy a retail full version of Win7. But the chances are good that a clean install of Win7 using the Upgrade version will work without having to install a qualifying version – XP or Vista – on a partition. If you create a partition on the new drive and install XP or Vista on it, the Win7 setup sees a qualifying version on the system and goes ahead with the clean installation on another partition. Unfortunately, Win7 will create a dual-boot system that allows you to boot with with either version at startup. To create a new partition, you use Disk Management in Windows XP or Vista or use a third-party tool, such as the free EaseUS Partition Master. I had a look on eBay (February 2017). An offer such this one is what you need: Genuine Windows 7 Home Premium SP1 32bit Full Version DVD and Product Key COA. It was a “Buy it now” offer for only £14.99. You must make sure that the seller is genuine by looking at the number of transactions and reading the feedback. Don’t buy an OEhttps://www.pcbuyerbeware.co.uk/blog/hard-disk-drive-ssd-and-flash-drive-management-in-windows-7-8-10/M offer, because an OEM version of Windows can only ever be installed on one computer. A retail full version can be installed on an unlimited number of computers as long as only one of them is using its Product Key at a particular time. Make sure that the disc comes in its original packaging. If it comes in just a sleeve, it could be a copy. A reputable seller won’t sell a rip-off product. Most laptops only have enough space to hold one storage drive internally. Unless your dead laptop provides two drive bays, if you merely want to transfer the contents of a working laptop hard drive to a new hard drive or SSD, you need to buy a USB-to-SATA adapter cable, shown below. 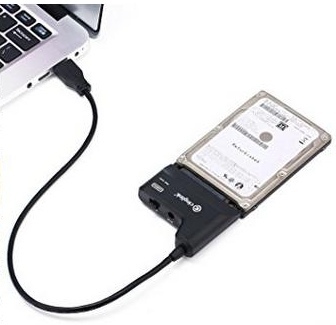 You connect the new drive to the laptop with the cable and clone the old drive to the new one and then replace the old drive with the new one. If you are replacing a hard drive with an SSD, you have to make sure that the SSD has a large enough capacity to hold the data from the hard drive. The free version of Macrium Reflect and EaseUS Todo Backup Free can clone the old hard drive to the new hard drive or SSD. Most laptops only have a single drive bay. The laptop in the video, below, has two drive bays. You just have to install the SSD in the second bay and use the cloning tool of your choice to clone the existing hard drive to the SSD. Then remove the hard drive and install the SSD in its bay. You can put the hard drive in the second bay, format it and use it as a storage drive. If you need that information, there are plenty of articles on the web on how to format a hard disk or SSD drive for every version of Windows. Note well that you must not use the full format option that Windows provides for an SSD. This is because an SSD is a wholly electronic device and a hard drive is a mechanical device. Windows accesses an SSD in the same way as it accesses RAM memory. However, an SSD uses permanent flash memory and a file system, so it must be formatted, but only by using the quick format option that Windows provides. February 5, 2017 in Hard Disk and SSD Drive Problems, Laptop Problems.